Plenty of power: with a continuous output of 3.5 kilowatts the BLUTEC 40D will easily supply two selfcontained air conditioners. Quartz precision technology delivers a pure sine wave voltage of exactly 230 V AC / 50 Hz – ideal for sensitive electronic appliances. Useful extra function: the generator can also be used for charging the starter battery. 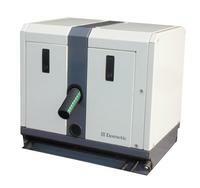 3.5-kW diesel generator for 230 volts alternating current. BLUTEC 40D is one of the most compact water-cooled diesel generators on the marine market, so you will easily find a place for it on board. Enclosed in an insulated stainless steel housing, the robust unit stands up to the rigours of the sea and keeps noise levels down to an absolute minimum. All functions are easy to manage by remote control. The illuminated display keeps you informed about all important operating parameters.